Characterizing the performance of dental air-turbine handpieces; Optical imaging techniques for dental biomaterials interfaces; Electron microscopy for imaging interfaces in dental restorations; Dental adhesives and adhesive performance; Mechanical stability of resin-dentin bonds; Dental cements: Formulations and handling techniques; Mixed-methods approach to wear evaluation in posterior composite dental restorations; Shape optimisation of dental restorations; Fibre-reinforced composites for dental applications; Fracture mechanics characterisation of dental biomaterials; Modelling bond strength in dental biomaterials; Fracture and ageing of dentin; Finite element analysis of stresses in dental crowns; Testing the performance of dental implants; Superplastic forming of dental and maxillofacial prostheses; Dental investment materials for casting metals and alloys. 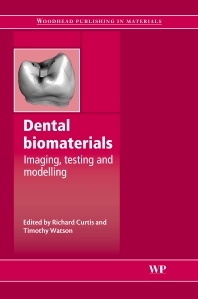 Dental Biomaterials: Imaging, Testing and Modelling reviews the materials used in this important area, their performance and how such performance can be measured and optimised. Chapters review optical and electron microscopy imaging techniques for dental biomaterial interfaces. Specific materials such as dental cements, fibre-reinforced composites, metals and alloys are discussed. There is an analysis of stresses, fracture, wear and ageing in dental biomaterials as well as an evaluation of the performance of dental adhesives and resin-dentin bonds. Chapters also review ways of assessing the performance of dental handpieces, crowns, implants and prosthesies. The book also reviews the use of computer models in such areas as bond strength and shape optimisation of dental restorations. Dr Richard Curtis is a senior lecturer at King's College London Dental Institute. He is the Superplasticity Committee Chair for the Institute of Materials, Minerals, and Mining. He is also the UK coordinator for European superplastic forming meetings and a member of the Academy of Dental Materials. Professor Timothy F. Watson is a clinician with an international reputation in the field of the microscopical analysis of dental materials. He is head of the biomaterials group at King's College London Dental Institute. He is a member of the British Society for Dental Research, the International Association for Dental Research and the Royal Microscopical Society. Both are widely published in the area of dental biomaterials.